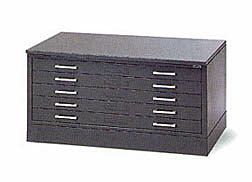 Stackable interlocking steel plan files offer quality & value in 3 sizes of 5 & 10 drawers. Features: Seamless drawer construction, a metal card holder and tracks smoothly on silent ball-bearing nylon rollers. All 5 drawer files come standard with a rear hood and a double hinged metal flap at the front to hold plans in place. Options:Sanitary bases and magnetic plastic drawer dividers. Dust Covers:Standard feature on all 10 drawer files. It keeps drawings flat & dust free. FILES FOR DRAWINGS UP TO 24" X 36"